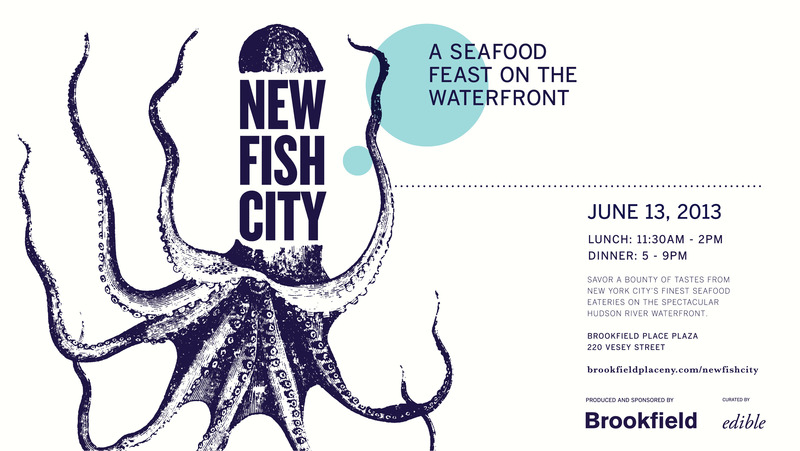 This Thursday, June 13th, “New Fish City” will take place along the Manhattan waterfront at Brookfield Place. This seafood feast features signature seafood dishes from some of the city’s top restaurants and food artisans. The event is curated by Edible Manhattan. Lunch will be served from 11:30am to 2:00pm and dinner will be available from 5:00pm to 10:00pm. Individual items are $10 and under. Some of the menu offerings include lobster rolls, crab rolls, and shrimp rolls from Luke’s Lobster. If you’re in the mood for more lobster, there’s a lobster taco from Palo Santo, Lobster BLT from Red Hook Lobster Pound, as well as a curry lobster dog from Asiadog. BLT Bar & Grill has a big eye tuna taco with pickled vegetables, mint crème fraîche, and cherry and black mint salsa that sounds quite fantastic. Enjoy fresh raw oysters from Brooklyn Oyster Party. Lastly, enjoy from specialty ice pops from Brewla Bars ice pops, from calcium packed craft-brewed root beer float to a vitamin boosted cherry pomegranate and red tea. The full menu can be found here.